Maggi remains the first love of kids, adults and old alike. Everyone has loved sooner or later in their lives the magic of maggi. This is one of the finest maggi I have ate outside my office. 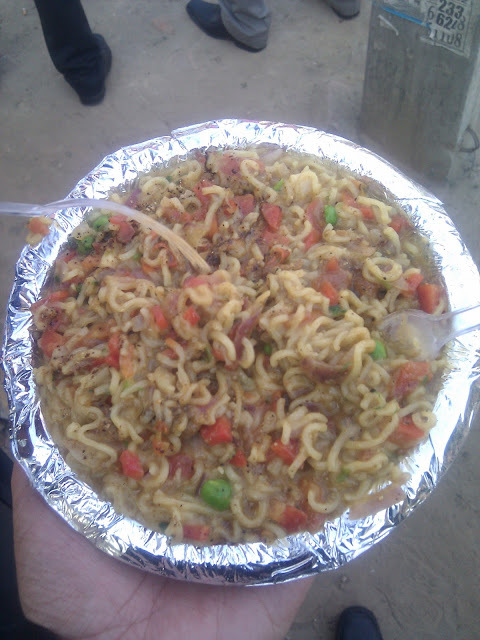 Priced at Rs 30 the maggi is full on tasty and full of veggies added by the person making it. He can make 15 plates of maggi's in one go and there is always a rush for the same. People say that the maggi wala bhaiya has Ford Figo and owns a Prantha dhaba in Udyog Vihar Phase IV also. These are the real entrepreneurs of India bringing Maggi masti to all. Thanks a lot!